The 50,000-mile sign-up bonus offer on the Lufthansa Premier Miles&More Mastercard from Barclaycard is back! The sign-up bonus on this card usually hovers around the 20,000-30,000-mile mark, but with this offer, you get 20,000 miles with your first purchase or balance transfer, and the potential to earn 30,000 more bonus miles when you spend $5,000 on purchases within the first 90 days. While 50,000 miles isn’t earth-shattering, this is as high as the sign-up bonus on this card gets, and it is usually only around for a limited time, so if you’ve been thinking about getting in on this card, now is the time to do it. One good reason to apply for this card is that it is a Barclay’s product, so if you’re all applied-out on American Express, Chase and Citi cards for the moment, it might be time to look at another issuer and another airline program. You might be considering applying for both this and the current US Airways Mastercard offer from Barclaycard, which is 40,000 miles with first purchase – but I would not suggest applying for both the same day since Barclaycard is strict about multiple applications. Even though the US Airways card’s bonus is 10,000 miles less and the annual fee is $10 more (at $89), in my opinion it’s still a better option than this one because US Airways charges much lower fees on award tickets than Lufthansa in general, but it all depends on your needs. Miles & More is the award program of Lufthansa, SWISS and Austrian airlines. The good thing about stocking up on Miles & More miles is that these airlines open up a lot more premium cabin awards to their own members in advance, unlike with their major US partner, United, and . So if you’re thinking about awards to Europe, it could be a good idea to bank some of these miles simply for that award space availability. Just beware the taxes and surcharges on these tickets can be expensive. 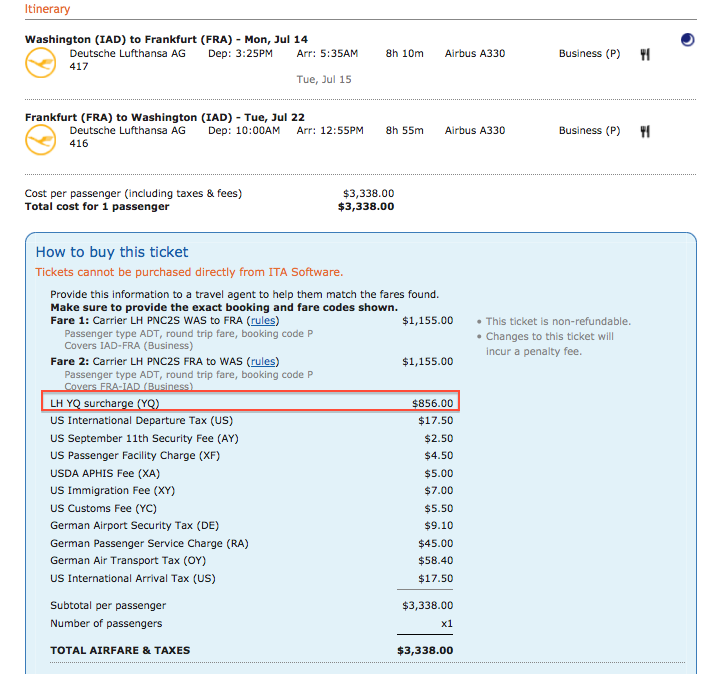 For instance, this roundtrip business class ticket over the summer from Washington Dulles to Frankfurt on Lufthansa would incur and $856 surcharge, which you’d still be stuck paying on an award. A much better deal in the case of Business and especially First Class. Lufthansa (and SWISS and Austrian) is also part of Star Alliance, so you can use these miles on any of the partner airlines, including United, and this presents another possibly great-value redemption option. Flying domestically is actually one of the Miles & More sweet spots in the award chart since domestic flights are 25,000 in Economy, 35,000 in Business and 50,000 in First roundtrip. Lufthansa’s award chart for domestic US travel. So you could potentially book business class award tickets at just 17,000 miles each way or 35,000 miles roundtrip, including on United’s transcontinental premier services planes. That’s fewer miles than you’d earn with the sign-up bonus alone on this card offer, so it’s something worth looking into. 50,000 miles is also enough for an economy class roundtrip ticket originating in the US to Europe on Lufthansa, SWISS or Austrian for US-based members – other carriers will be 60,000, and remember, you can book one-way awards with Miles & More. As a reminder, Lufthansa Miles & More is also a transfer partner of Starwood Preferred Guest, so you can top up your account for a specific award using those points, and you also get a 5,000-mile bonus when you transfer increments of 20,000 points. This credit card gives cardholders an annual companion ticket. According to the card terms, “Cardmembers will receive an Economy Class Companion Ticket upon the first use of your new Account for a Purchase or Balance Transfer and on your Account opening anniversary every year you are a Cardmember.” This companion ticket is good only for economy travel from the US to Europe/Middle East/Africa and Far East and must be booked in H class (not full-fare economy, but not the most discounted either) or higher on Lufthansa-operated flights only, so you will be paying more for the first ticket, but getting the second one for free. Like other companion tickets, taxes and fees must be paid for the revenue ticket as well as the companion ticket – the companion portion is only the airfare. While most people buy the cheapest fares, with Lufthansa, you only earn 50% of the mileage on these, so this program isn’t for anyone who wants to get full mileage on the cheapest fares. However, if you do pay for refundable or high-fare classes the companion ticket could be a decent value in some cases. As you would expect (or at least hope!) this card doesn’t charge foreign transaction fees for purchases outside the US, so you won’t get hit with 1-3% surcharges on your purchases if you actually do decide to put your miles to use and hop over to Europe. That’s the quick rundown on the card for those of you who might be in the market for a new mileage program to diversify your points portfolio. For more information on it as well as an explanation of how the companion ticket works and typically prices out, check out this post.